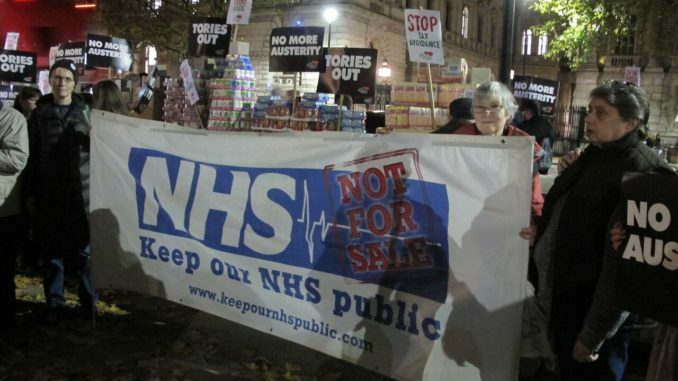 The evening before the Budget of 22 November, health campaigners from Oxford and several London branches of Keep Our NHS Public and Health Campaigns Together joined The People’s Assembly’s pre-budget protest against austerity behind a huge food-bank on Whitehall and many NHS banners across from Downing Street. We drew attention to the Government’s underfunding of the NHS ahead of the Autumn Budget next day. Despite leaders of multiple NHS organisations, think tanks and politicians pleading with the Government to properly fund the NHS – a message ringing out from health professionals, experts and campaigners – Hammond pledged an extra £2.8 billion over the next 3 years. With £1.6 billion extra for 2018/19, this is under half of what experts told the Government was needed to keep the service running. Simon Stevens’ request for the £350 million a week for the NHS, promised in the run up to the Brexit vote, was ignored. The NHS is in fact getting £350 million to see it through the whole winter. Health chiefs have commented that this simply isn’t good enough and they threaten to start publicly reneging on NHS targets. Creating even more pressure on the NHS is this Government’s continuing apathy towards Social Care. There was no mention of more money for Social Care in the Budget, demonstrating the Government’s attempts to wash its hands of Local Government and pretend that social care is not its problem. Ignoring Social Care creates more strain on NHS services and KONP urges the Government to pay more into the social care budget in addition to the NHS. The MP for Lincoln, Karen Lee, refuted in Parliament Sajid Javid’s claim that the Government is funding the NHS adequately. No one sums up the crisis better than Neena Modi, president of the Royal College of Paediatrics and Child Health, responding to Hugh Pym’s tweet quoting the chair of NHS England. This government are laughing at my profession whilst we work in crumbling conditions to help care for the nation.